Hand Coding – Refenestration Daily. I came across this recipe in one of America’s Test Kitchen’s cookbooks a couple of years ago, and I’ve been making them ever since. They’re a nice snack for parties, and you can make them ahead of time too. You might already have some of these spices in your pantry, but keep in mind that ground spices start to lose their flavor after about 8 months. If your spices are older than that—or if you’re not sure how old they are—you may be best off buying new ones. Adjust the oven rack to the middle position and heat the oven to 350°. Line a rimmed cookie sheet with parchment paper and spread the pecans in even layer. Toast the pecans for 4 minutes, then rotate pan, and then continue to toast them until they’re fragrant and their color deepens slightly, about 4 minutes longer. Transfer the cookie sheet with the nuts to a wire rack. For the spice mix: Stir together sugar, salt, cinnamon, cloves, and allspice in medium bowl, and set the bowl aside. For the glaze: Bring the rum, vanilla, brown sugar, and butter to boil in medium saucepan over medium-high heat, whisking constantly. Pour the pecans into the saucepan. Pro tip: Grab the pecans’ parchment paper by the long edges, and then let the parchment paper form a U shape along the short edges. That gives you a funnel that makes it easy to pour the pecans into the saucepan. Stir in the toasted pecans and cook them, stirring constantly with a wooden spoon or a heat-safe spatula until the nuts are shiny and almost all of the liquid has evaporated (about 1½ minutes). Transfer the glazed pecans to the bowl with the spice mix; toss them well to coat them. Note: You may find yourself tempted to use your fingers to help toss the nuts, but keep in mind that they’ve just come off the stove and they’re wicked hot. I tried tapenade for the first time at a café a few years ago. And I really liked it, so I sought out a good tapenade recipe—I finally settled on this tapenade recipe that I found at All Recipes, and I’ve been making it ever since. For best results, make the tapenade one to two days before you plan on serving it. That’ll allow the flavors to mingle, and it’ll be even yummier. Peel the garlic cloves and mince them. Then put the minced garlic in your blender or food processor and pulse to further mince. Use a fork to transfer the olives from the jar to your measuring cup. After you’ve filled the measuring cup, place your fingers over the top of the measuring cup to form a makeshift strainer, and turn the measuring sideways over your sink to drain the gist of any brine. Then empty the measuring cup into your food processor. Measure the capers and use the same finger trick to drain their brine before adding them to the food processor. Rinse the parsley, and gently pat it dry with a paper towel. Then chop the parsley and add it. Add the lemon juice and the olive oil. Blend until everything is finely chopped. Transfer the tapenade to a small bowl or serving dish, and then season it to taste with salt and fresh cracked pepper. Optional: If you like your tapenade the way I make it, be generous with the pepper. Typically, I’ll go for three twist of the pepper mill, and then I’ll stir the tapenade with a spoon; then I’ll add three more twists of the pepper mill and stir the tapenade once more. If you don’t plan on serving the tapenade right away, put a lid or plastic wrap over the container and keep the tapenade in your refrigerator; take it out about an hour before you plan on serving it. My family has been using this chocolate chip cookie recipe since I was little. I think we originally got it out of a magazine, and it’s been one of our go-to recipes for years. For best results, set out the butter and eggs on your counter for a few hours beforehand so that they can come to room temperature by the time you have to mix them in with everything else. As a rule of thumb: The butter is soft enough when you can easily squish the stick between your thumb and index finger. Mix together the white sugar and brown sugar. Then cream with the butter. Add the eggs and beat well. Then add the vanilla. In a separate bowl, sift together the flour, baking soda, and table salt. Then slowly add them to the wet ingredients. Add the bag of chocolate chips and gently fold those in with a spatula. Line your baking sheet(s) with parchment paper, and portion about 6 dollops of dough onto each sheet. Place the cookies in the oven for 5 minutes, then swap the baking sheets and continue baking for another 5 minutes. When they’re done, their tops and edges should have just started to brown. Optional: Immediately after taking the cookie sheets out of the oven, sprinkle the tops of the cookies with kosher salt. Allow the cookies to cool for 5–10 minutes before transferring them to a cooling rack. 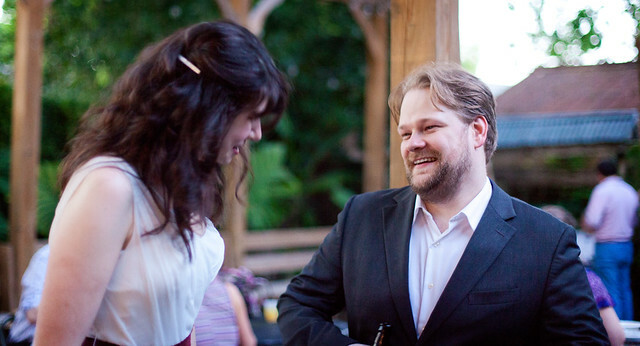 My brother, Adrian, and his awesome wife, Margaret, got married in Boston over the summer (in Cambridge, specifically). 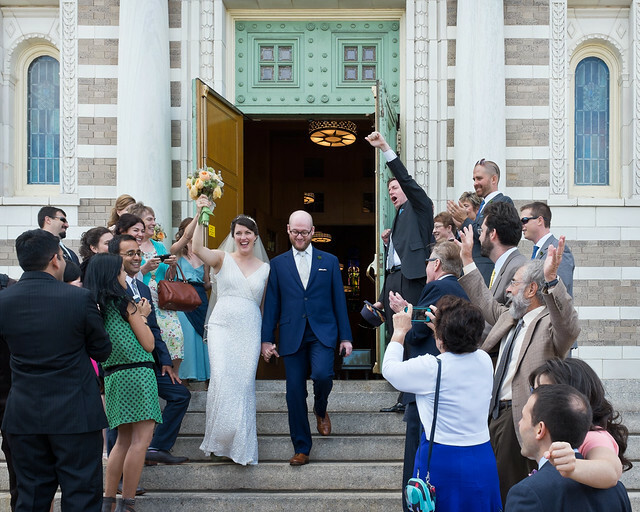 They got married near the end of August, and the whole thing just couldn’t have been better— the highs were around the mid-70s, and everything went off without a hitch. It was just wonderful. I would have normally brought my DSLR with me with me to Boston, but in the weeks leading up to the wedding, I realized that pairing a DSLR with a wearing-to-a-wedding dress would have all the grace of a boat anchor around my neck. So I decided to rent a Fuji X100S—it worked a treat, and it couldn’t have been half the size of my DSLR. The wedding was on the Saturday afternoon at St. John the Evangelist in Cambridge. The church was only a little over a mile from the hotel where we were staying, but with the heels I was wearing, I wasn’t about to walk there. So we just took a bunch of taxis, and that worked out fine. Margaret and Adrian wrote their own vows and, well, let’s just say that I was glad that I was wearing waterproof mascara. I cried a good bit, especially toward the end of the ceremony, but they were all joyous tears. And their high five at the end of the ceremony was the icing on the cake. I couldn’t be happier for Margaret and Adrian. Those two are the bees knees, and I wish my brother and my new sister the very best. I went down to Lafayette, Louisiana, last weekend for my friends Josh and Leah’s wedding celebration. Leah and Josh live in Boston these days, but Josh grew up in Raine (which isn’t too far from Lafayette), and they wanted to have the wedding celebration there. One of the main events, other than the reception itself, was a crawfish boil the afternoon of the reception. This was my first time going to a crawfish boil (and I hadn't actually eaten unshelled crawfish before either). I love shrimp, so I figured it’d be fine—my only small moment of pause was the mental image of eating food that still had its face on it. But in the end, I followed along with the more seasoned crawfish eaters, and things went just fine. Lafayette isn't a big town, but it’s pretty charming. For the most part, I just parked my car at the hotel and walked almost everywhere—I walked to restaurants, I walked to the reception, and I ambled around for general photo-walking. A goof on my part was that my feet were frowning a bit from all that walking, but I probably should have know better than to jaunt around Lafayette in those strappy wedge sandals. I’m so glad I had a chance to join Leah and Josh for their wedding celebration. They’re a fantastic couple, and Lafayette is a delightful little town.